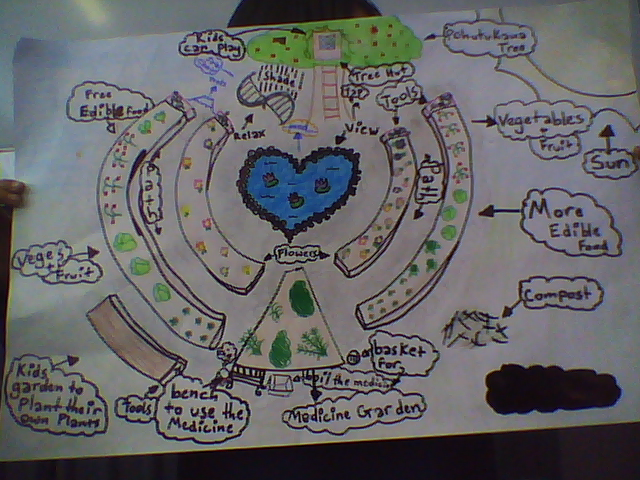 The main theme of this garden is ‘whanau’.Thats why theres a heart shaped pond in the heart of the garden.It obviously represents love and its a great view from the tree house in the pohutukawa tree where children can play.Under the tree is a bench which can spin around and you can relax on it under the shade of the tree and theres a tap there too.Children can also plant their own plants behind the vege garden on the left.There are tools at the end of every garden bench so you can plant more or take out plants.There is also a medicine garden at the bottom of the pond.Near the medicine garden is a bench where you can use the medicine plants.You can prepare the medicine in the pot next to the bench.The flowers near the pond is for the view and show.And lastly there is a compost mount behind the veges on the right for recycling and we put it behind the garden because it woudn’t fit with the other plants. I really love the thinking you and Hineuwera put into your garden design. You have shown great creativity and what is best, is that you can explain why you did things the way you did. Keep up the fantastic work Lydia!